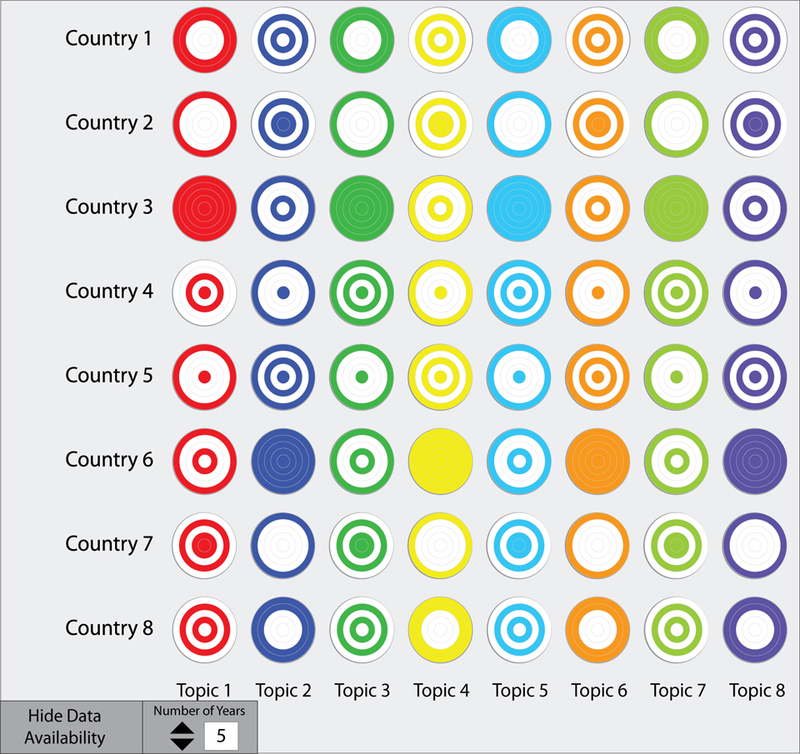 In 2011, the World Bank made its data catalog open and asked developers to make applications that visualized this data. The data was comprised of 214 countries, 3000+ data points across 16 categories, and went back roughly 50 years. At this time I was in the middle of a residency at Fabrica, and I dedicated myself to producing a model that could be used to compare all the data in the catalog. In this video you can see changes made to the Orbital Comparison chart to make it more flexible in order to handle this data set. It quickly became clear that to make the chart less daunting to new viewers, there had to be a way to allow them to view it in a form they were comfortable with. Once comfortable, there had to be options for adding more data and increasing the complexity. In this way the chart could serve simple or complex searches for people new to data visualizations or people used to seeing data in new ways. One of the first issues I found with the data was the lack of data consistency available for each country. At its core this is a simple question: For a given year and country, is the data I am interested in actually in the data set? You can represent this simply enough with a circle that is either filled in or not. So to design a tool to help people using my application, I started from there and sought to make it useful. Here is the chart at a very simple level, with one country and one topic. In this chart, the outermost ring represents the oldest year in the current selection and the innermost ring is the newest year in the period. On the right is a more complicated version of a 1 x 1 version of this chart, showing five years at a time, each ring having a border to ensure a series of years without data didn’t become confused with a single year. The application allowed for eight countries and eight topics to be compared at once. This creates a chart with a pop art aesthetic. Again, to allow people to learn the chart more easily, the number of countries and topics being displayed at once could be changed to scale to whatever the user needed or was comfortable with. In this way it became easier to find a set of countries that had data for the topic you were interested in, or vice versa, in order to make a complex comparison with the data. The next chart I needed was one to handle data over time. I needed a chart that could fit a lot of information into a small space due to the amount of information that would need to be displayed, so I made another chart based around a circle. 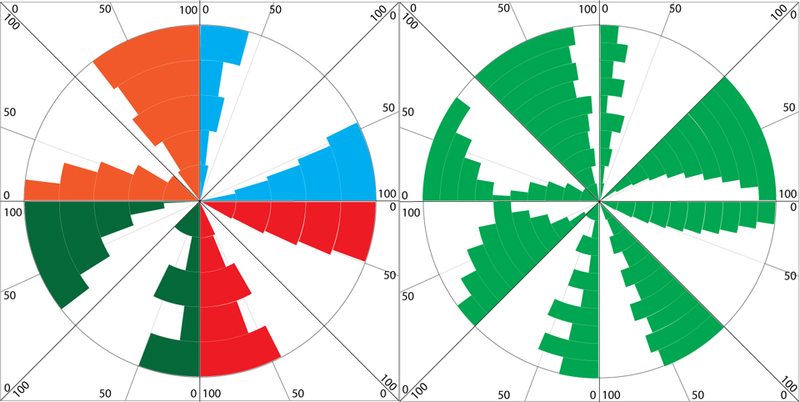 Creating distinct, static sections of the circle to display data allows the user to become familiar with reading one section, become familiar with it and not having to reinterpret the display as they would if the sections of the circle were based on the number of data points. Again years are “stacked,” with the oldest year on the outside and newest in the center. The function of this chart is to be able to show in each section a single data point for one country over five to ten years, to be able to display averages over those numbers as a point of reference, and to build up to being able to make more complicated over time comparisons. Eight sections allowed for data to be shown without becoming more complicated. This innate complexity does allow for some valuable comparison possibilities: One piece of data across eight countries over ten years, eight data points for one country, four data points for two countries, etc. Missing data points would appear as full black arches to avoid any confusion between a very small value and no data. The chart itself is percentage based, 100% being the highest value for all countries across the time period, with 0 being zero. The angle of the arch represents the data value, which can be tricky to interpret, especially slight differences. To ease that, when the user is hovering their mouse over the chart, a line is drawn from the center to their mouse with a read out of the value that line represents and supplying an easier way to be sure of the comparison of two angles in the same section. The example on the left represents four data points for two countries, arranged so the same data point graphs are adjacent. 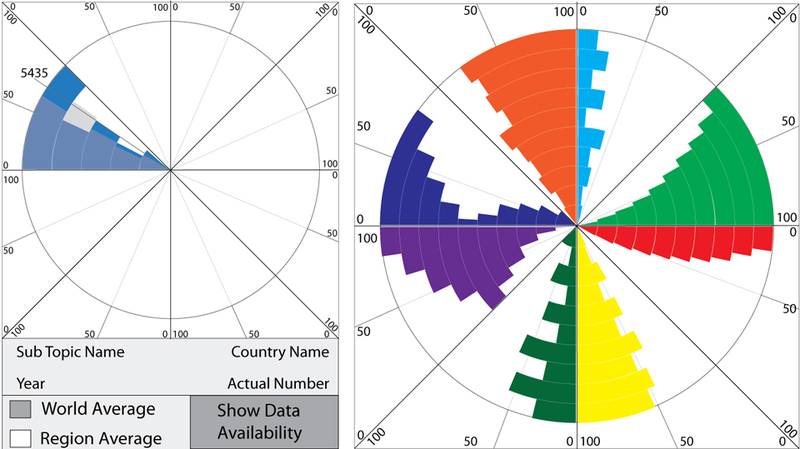 On the right is a chart of eight different country graphs for a single data point, as well as an alternative layout that loses the white space comparison in order to keep the growth of all sections from 0 to 100 going in the same direction. This has its advantages and disadvantages, but I am generally inclined to allow users to customize a chart as much as possible to help them understand it.